What you see in the picture is my 1941 Harley Davidson WLD that was fully restored using NOS or original OEM parts to AMCA standards. 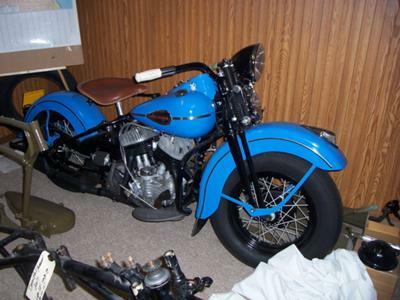 This vintage Harley Davidson motorcycle scored at 99.7 points out of 100 points. This elegant, old Harley has been photographed and featured in Harley Davidson Documentary books by Herbert Wagner and Mark Mitchell. Visitors who stop by to admire this vintage beauty are invited leave their opinions and questions AND their contact information if they wish to receive notification of any replies in the space below provided by for listing GoGoCycles Used Motorcycles for Sale and the owner will get back with you as soon as possible. Strike Lightning would also encourage bikers to submit any photos they have of 1941 Harley WLD motorcycles they may have on hand to help build a gallery that the biker community will enjoy. Cool old bike. Wish I could afford to buy. Is there a contact number ? Can you tell us anything about your Harley Davidson WLD like who was the original owner? What is the paint color? Do you know its value? Are you interested in selling it and if so, what would your asking price be?